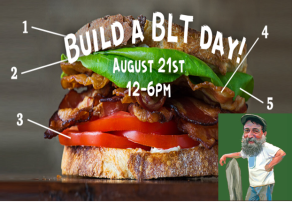 Start dreaming of Ray’s amazing varieties of heirloom tomatoes, Ray’s farm fresh bacon, and lettuce on crusty bread with home made mayo – we are all going to make the BEST BLTs. Come build your dream sandwich and wash it down with some farm brewed beer! Vegetarian options will be available. Sunday August 21st, 12 to 6PM! SEE YOU THERE!